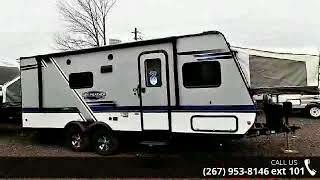 Hi, I am interested in your 2018 JAYCO Jay Feather (stock #13540) listed on Autotrader for $20,888. I'd like to get more information about this vehicle and confirm its availability. This X23B Jay Feather expandable by Jayco features a u-shaped dinette, single slide, plus front and rear beds.As you enter this model, to the right, there is a u-shaped dinette with overhead cabinets. A sofa slide on the road side provides additional floor space in the living/kitchen area. A refrigerator is next to the sofa and across from the kitchen amenities. To the left of the entry door there is a pantry, kitchen sink, three burner range, microwave, overhead cabinets, and a TV.The rear bath includes a sink, corner shower, and a toilet.The front bed has an overhead storage with with a curtain between the bed and living/kitchen area. The rear bed also has overhead storage and with a curtain between too. There are two wardrobes next to the rear bed and across from the bath.Dont forget the outside storage compartments for your outdoor camping gear, plus much much more! Fretz RV is a top dealer for all 2017, 2018, and 2019 Jayco trailers in the Philadelphia, Pennsylvania, Delaware, Maryland, New Jersey and New York Areas. These campers come in as Travel Trailers, Fifth 5thWheels, Toy Haulers, Pop Ups, Hybrids, Tear Drops, and Folding Campers. Brand Names Hummingbirds, Jay Series Sport Camping Trailers, Jay Feather, White Hawk, Jay Flight, SLX, Bungalows, Eagle HT, Eagle, North Point, Pinnacle, Designer, Octane, SL, Talon, Seismic, and Wave.We also carry used and Certified Pre-owned RVs like Forest River, Mobile Suites, DRV, Redwood, T@B, Dutchmen, Keystone, KZ, Grand Design, Casita, Scamp, Cougar, Montana, Raptor, Springdale, Passport, Salem, Catalina, Coachmen and Airstream, and are always below NADA values. We take all types of trades. When it comes to RVs, we are your full service stop. With over 72 years in business, we have built an excellent reputation in the RV industry to our customers as well as our suppliers and manufacturers. At Fretz RV we have a 12,000 Sq. Ft showroom, a huge RVPartsand Accessories store. We are adding a 30,000 square foot Indoor Service Facility opening Spring 2018. We have full RV Service and Repair with RVIA Certified Technicians. Bank financing is available for RV loans with a wide variety of RV lenders ready to earn your business. It doesnt matter what state you are from, we have lenders that cover those areas. We have different RV warranty companies available. We can provide you with rapid RV Insurance quotes with minimal information. We have an RV rental program to serve your short term RV needs. We have detailed videos on RV Trader, RVT, Classified Ads, eBay, and Youtube. Like us on Facebook! Serving all areas of the world! Check out our great Google and Dealer Rater reviews at Fretz RV. We are located at 3479 Bethlehem Pike,Souderton, PA 18964215-723-3121Start Camping now and see the world. We pass RV savings direct to you. Price does not include Taxes, Tag, DOC Fee, Destination, Freight, or Prep. Call for details.